We are finally up for air after a hectic 18 months; it must be time for an update. Huge software changes, process changes and of course a few new faces for the KLAS team. There are a few constants though. The old girls. Kristen, Kerri and Kirsty – the special K’s. We have bedded down our Practice management software and billing software changes. These changes were essential to take us into the next era of accounting and how our industry is shifting. Cloud is where everything is shifting and as much as we hate the thought of our data floating on a fluffy white thing in the air (it of course isn’t) this is what the next 10-20 years looks like for business, until the next innovation. So why fight it? We have embraced it. Yes it’s taken some time and a whole lot of frustration and we have burnt a few team out as we have gone (myself included) But to look at where we are TODAY to where we were this time last year, or the year before that and I almost want to cry with pride. The business is not comparable; it’s just not the same business. In our current time it is such a challenge to get accountants, and accounting support team. It is also incredibly difficult to make money in accounting as our margins are continually squeezed and our costs are high. There are times I question is it worth it and should I be working for someone else (we have all had those thoughts) but I am passionate about what I do and I know making the changes to processes will lead to a better business. This is the lesson for all business. Always look for a better way. BUT to do this we have had to make some decisions in how we operate and change our game. Our head office is in a small rural town, Tenterfield. There are 4 accounting firms all pulling from the same talent pool. A new accountant to town would be excused for feeling like they are in a feeding frenzy of piranhas when ‘the accountants’ find out there is fresh blood in Tenterfield. It is also a competitive space out there in getting staff, in accounting in general. No longer is it about people wanting a job so badly they will do anything (like when I started working) it is now what can the employer do to attract that member and retain them. So, here was our first and key decision. Go cloud and employ Virtual accountants. I don’t mean the video game type I mean people that work for KLAS but they work from home or a location of their choice but they are employed by KLAS. They manage our clients as any of our team would, they take direction from me, they spend a lot of time on video calls with all of the team making it feel like they are all together and here’s the key. It gives people freedom and flexibility and that is the current buzz. Who wants to spend 2 hours in traffic when they can get up, get ready and turn the computer on (it’s questionable if some even ‘get ready’ but a pyjama day is totally on the cards unless you have a client video meeting booked in). So now we are competitive in the employment market, we can find qualified and very skilled team members and we attract the right type of team member that fits into our culture without the need to ‘settle’ on what is available. Smart business. Our virtual accountants are Tonja Hunt, Gold Coast, Karla Obst, Toowoomba and Sharon Solomon, Sydney. These women, yes there are more women, then come to the KLAS head office monthly for training, team sessions and to see clients. We do always advertise for Local accountants when looking for accountants to ensure we explore all avenues. Salaries have increased in accounting because of demand, there is no denying, and as a result we have also looked at ways they we can modify the business to allow for such large increases to be sustained. In comes our Phils team. We have two CPA qualified accountants based in the Philippines that work directly for our team. No it’s not a sweat shop, it is a highly professional business that is focused on team culture and education and nurturing their team and their families. It is a perfect fit. Our team work within a large office with ‘The Outsourced Accountant’ (TOA). They then are in a group within TOA that are employed by KLAS. We train them, they talk with us on video regularly (by the hour some days) and they are also a big part of our team. They are part of our families. They will come to Australia in March to see clients, have sessions in person with the team and of course explore Australia and Tenterfield. These team members are Jessie Tayag, who is our accounting gun and Manager and Clarissa Villanueva, Excel genius and all-rounder. Yes more ladies. We are finding that with each outsourced employee, we bring on an Australian team member also. So we are growing in both locations and most certainly not sending Australian jobs overseas. And yes the work is fully supervised. The two teams complement each other by allowing a cost effective option for processing work whilst creating enough margin in labour to pay our higher qualified and higher salaried team. Our Tenterfield team of course remain. Although smaller in size now they make up for that in effort. This is our client facing team and we handle all client meetings, queries and support. Kerri is running our Xero support, along with our other accountants, but is doing training and configurations like it’s going out of fashion. The Xero adoption has been enormous and it truly is changing people’s lives. If you want proof ask Tina Bulmer, isn’t that right Teen? There is a long list of Xero lovers and we are thrilled with the changes it has been making to people’s business both in Tenterfield and all of our ‘virtual clients’ based in other locations all throughout Australia. The cloud makes it so much easier. It’s all live, we are all in the same accounting file and the support is at your fingertips. 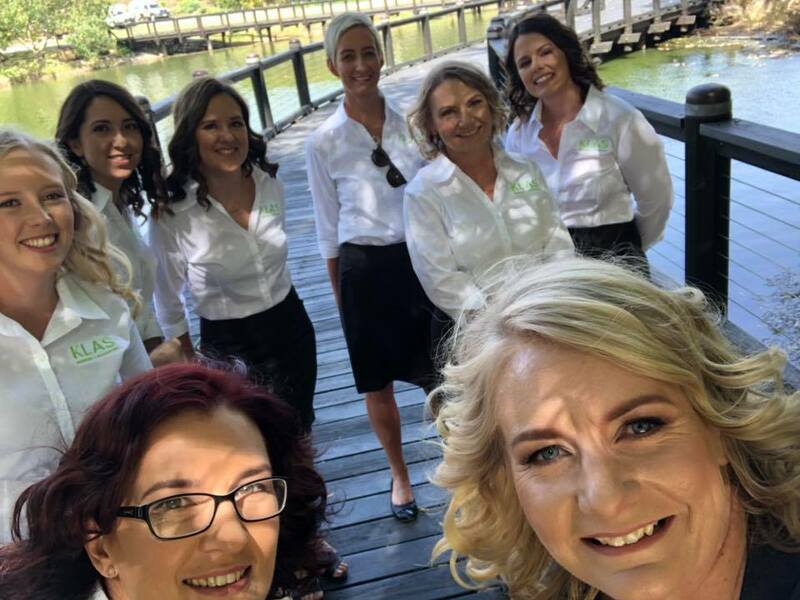 Our Tenterfield team include Laura Lee, Systems Support, Belinda Paynter Administration Manager, Kirsty Ware Client Services Manager, Kerri Ford Xero and Accounting Support then there’s me – who at the rate things are going will be out of a job with all these guns stepping up. You will have noticed our workflow is quick. This year we are on top of things and it is us chasing you to get work into the office. It’s a great feeling, although many of you are probably sick of our calls, but this shows the change in workflow and efficiency and takes us back to our ‘old’ days. Totally on top. All our accountants are calling and having contact and you are familiar with more of our team than before. If you have missed the news the business name has also changed to KLAS Business + Accounting. Now that’s a whole lot easier to say. Thank you all for your support and encouragement and we look forward to catching you before Christmas.